Global population growth and increased human welfare levels have led to a fast increase in demand for high quality foods. The FAO estimates that “global meat demand in 2030 will stand at 72% above the 2000 value” whilst the aquaculture market that includes fish farming is expected to grow 50% between 2010 and 2030. Muslims are major consumers of fish and Halal Certifying Bodies that ensure the food is Halal have a major role to play in this new reality. The concept of farm to fork that we normally are aware of in Halal Certification Processes, and about which Halal Certification Bodies talk, when we specially discuss meat from animals, is and should be also applicable to meat from fish. Fish must be fed with food and proteins like all living beings, and the sources of the feed are important for Muslims. The role of Halal Certifying Bodies is missed, or is less visible, on farmed fish, there being the belief among Muslims that all the fishes are Halal is dangerous. The issues concerning what the fish are fed is overlooked by most Halal Certifying Bodies. Also animal welfare that is applicable to farmed animals do not seem to be concern of Halal Certifying Bodies, when applicable to farmed fish. In Europe, the fish welfare is already an issie subject of studies. In 2014 UK’s Farm Animal Welfare Committee (FAWC) – a UK government advisory body – calls on the EU to amend its existing animal welfare legislation to end inhumane methods for killing farmed fish. Coming back to fish farming, and what the fish are fed, it is a concern for all Muslims, and therefore there is an important role to play for Halal Certification Bodies. Traditionall, fisheries produce fishmeal in a process known as “reduction” or “industrial” with the fish caught at sea that is transformed into meal and oil. Because these reduction or industrial are heavily regulated, and supply has remained relatively constant, and demand is high with increased fish farming worlwide, there have been huge increase in prices of fishmeal (meat and oil). 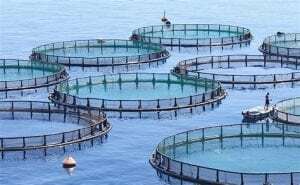 As a result, alternatives are increasingly used for use in fish farming. Fish farming represents over 50% of global fish production for human food and significantly contributes to global food security. Surely fast-growing aquaculture sector can become even more sustainable by using fish feed made from a range of sustainable raw materials, from algae to insects. By moving away from fish feed made predominantly from marine wildlife, the fish farming sector contributes to global food security, preserving the health of oceans and driving sustainable economic growth,” says François Simard, Deputy Director of IUCN’s Marine Programme. There is a need to look into farmed fish are fed, and the Halal Certification Bodies need to focus themselves to fish farms. As Muslim consumers become more aware of Halal, and rumors are spread, most certainly with all probability not fake that fish are fed with animal and najis (impure) products mixed into feed, and in un-hygienic and illness conducive environment in fish farms to danger to human health are known, as recent May 2017 report by FAO shows on tilapia fish from China, Halal Certifying Bodies have a major role to play. Recent development in EU (European Union) allowing the use of processed animal proteins (PAPs) derived from non-ruminant farmed animals (mainly from pigs and poultry) in fish feed are worrying signs for Muslims residing in Europe, and Muslim countries that import farmed fish from Europe (and elsewhere). Muslims may be already eating farmed fish that have been fed with porcine and non-Halal chicken sources. In unregulated farmed fish in Asia, and elsewhere, the fish surely are fed with animals proteins. One of cheap animal proteins is plasma, derived from pork’s blood. There is a major role for Halal Certifying Bodies to look into fish farms, and Mosques and Ulama (religious scholars) have the responsibility to warn Muslims that not all fish they may be consuming is Halal. The cycle from farm to fork is very important in Halal food and farmed fish, in an increasingly competitive market is surely not Halal. Halal Certifying Bodies must make effort in certifying Halal fish farms that feed only with fishmeal (from sea fish) and vegetable-based proteins. The author is CEO of Halal Trading & Consulting (EU Halal) based in Portugal.